IT’S THAT TIME OF YEAR !!! We are meeting with brides and other vendors to discuss, thats right – summer and fall weddings and events! These cold winter days are spent in meetings, writing proposals, and dreaming up fabulous ways we can help you celebrate your big event! Here is a little inspiration to get you in the party planning mood…..
Mantle piece with lush sprays of white dendrobium orchids. Remember, you create the scene, regardless of where your location is. Traditional or non-traditional, we can create a stunning focal point with flowers. This couple chose to get married in front of a huge fireplace so it was a no brainer to decorate the mantle. However, we did have to decide to decorate ONLY the mantle for the ceremony. It would be the first things guests would see when they walked in so we really needed to wow them! Any other smaller florals would distract from this focal piece. This was the best use of the ceremony flower budget. Additionally, the reception was in this room so they got full use of these flowers the entire evening. 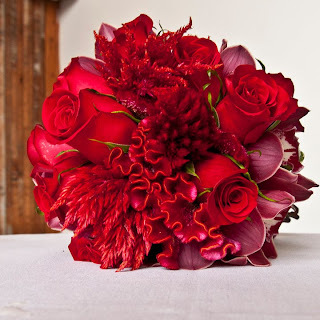 There are so many ways to use red floral tones in bouquets. As pictured here, we chose red roses, burgundy cymbidium orchids and 2 types of celosia- paintbrush or plumosa and cockscomb. 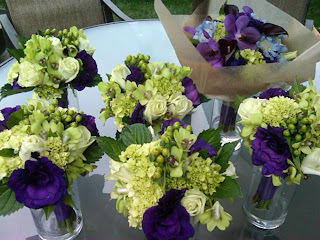 Bride and bridesmaids bouquets in a fresh green shade with an accent of plum. This is one of my favorite color combinations. The spring green tones can be used as a neutral palette or to pop out a dramatic accent color. Flowers used for these bouquets were hydrangea, hypericum berry, dendrobium orchids, and lisianthus. To make the bride’s bouquet stand apart from the others we added mini callas, scabiosa and aranda orchids. This bridal bouquet simply screams spring! 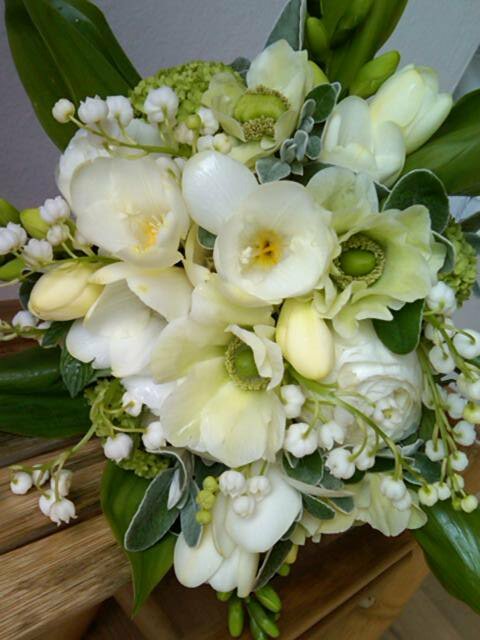 To create this little beauty you need: anemones, lily of the valley, freesia, viburnum, sage and a delicate hand! These little blooms are so small and sweet they need to be handled gently and with lots of love! 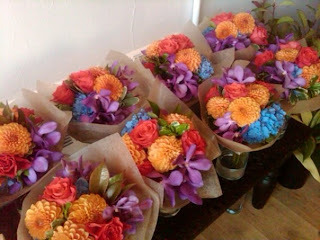 When you think of mixing blue, apricot, burnt orange, purple and green together you may think- yikes! a rainbow wedding. But after finding the proper tones and textures – you can create a real show stopper! I love the vivacious quality to these bouquets and the freshness of the dahlias and their “peppery” scent was a lovely treat for the senses.